Ron Kirn's Strat Build TUTORIAL! 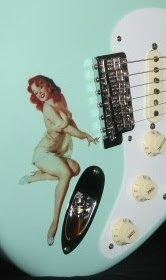 Ron Kirn builds super-Strats and Teles. Above, Ron shows us how he shields with copper sheet; adding solder tacks at one inch intervals. Everything is flush. Is that some serious shielding or what?!! 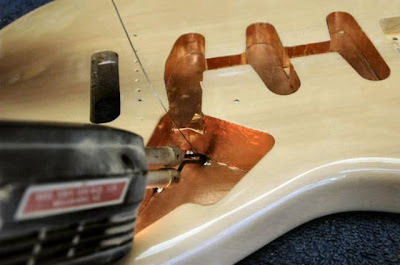 Kirn recently added an extensively photographed Strat Build Tutorial to his website. In fact, his site is a library of tone curriculum material! Even if you're NOT looking to build your own, there's a lot of good upgrade info. here-- such as, ohhh... SHIELDING!! -- and much, much more! Not every builder just lays it all out for everyone free like this. A great step by step process resource!